I spy with my friend’s eye, something beginning with yum! 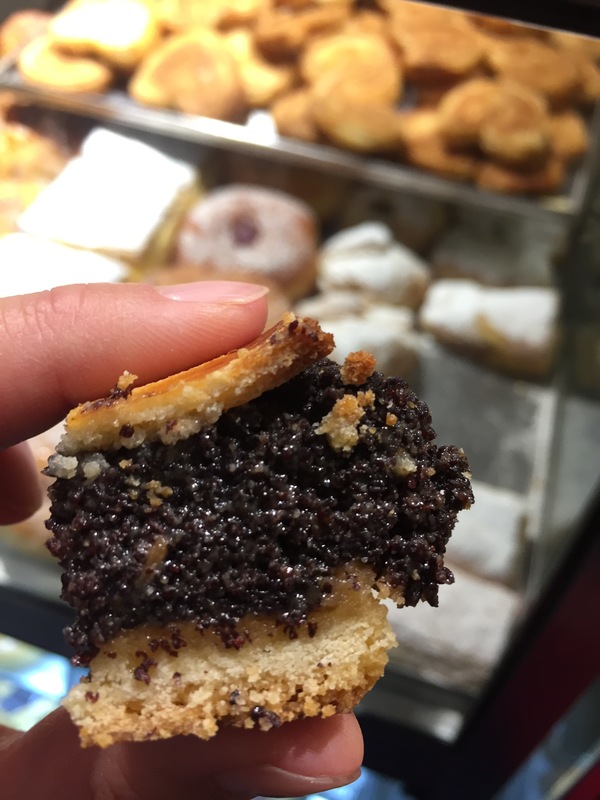 It is so lovely me that my friends think of me when they see a new eatery and they send me photos, it’s like the foodie version of Gossip Girl (xoxo). Haha! 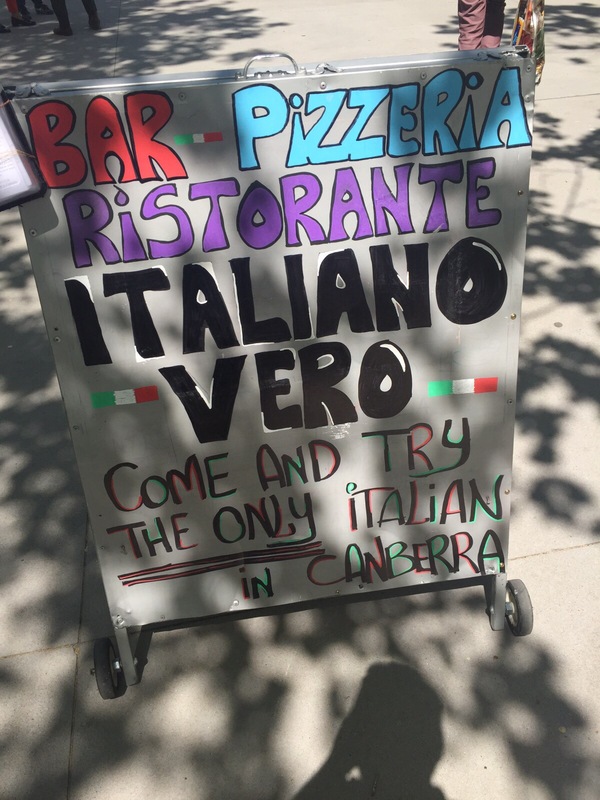 Spotted: A new Italian eatery in Civic making big calls about being the “ONLY Italian in Canberra”, I hope Italiano Vero lives up to the expectations it is creating. Have you eaten here yet dear reader? The menu seems extensive and everything seems reasonably priced. Thanks for the photos and heads up Thomas! Nothing annoys me more than wasting a voucher, not a discount voucher but a prepaid voucher card with an expiry date. 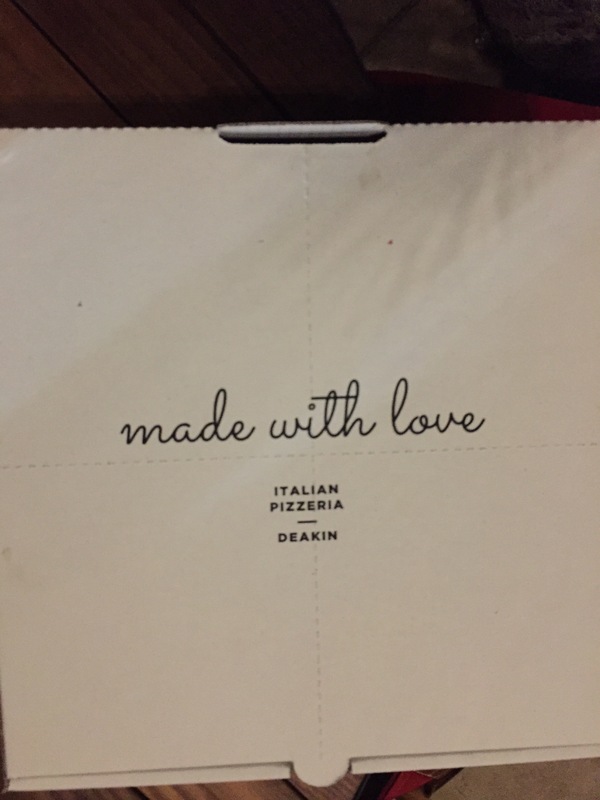 Luckily for us Jamie’s Italian gift vouchers don’t have an expiry but we were using up a Dendy voucher before it expired so we thought we’d continue on downstairs with our voucher run. For once we were able to get a seat inside and considering it was 38 degrees outside, it was a happy change of scenery. The menu looked like it had changed since I had last been (I didn’t blog the last three visits), but TimmyC just made sure that they still had his good ol’ favourite tagliatelle pasta and he was set. Can you spot your favourites in the new menu layout? Crispy prawns wrapped in angel hair pasta with tomato, basil and chilli sauce ($14.50). I chose this as a last-minute impulse even though I agreed with TimmyC that all we needed was one entree and two main sized pastas because we weren’t that hungry after popcorn consumption and it was so hot outside. 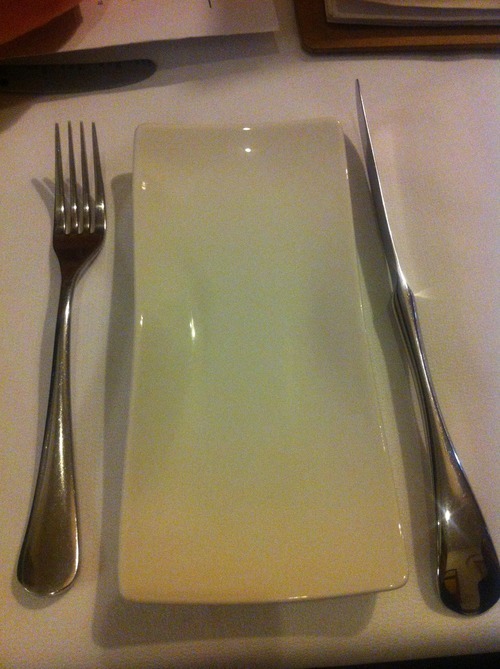 I should have stuck with that decision as I felt that this dish was disappointing. Sure the pasta gave the prawns a crunch but the prawns weren’t particular big or sweet. Don’t be put off by the black squid ink looking sauce, it was a really creamy mayo and was the only saving grace of the dish. 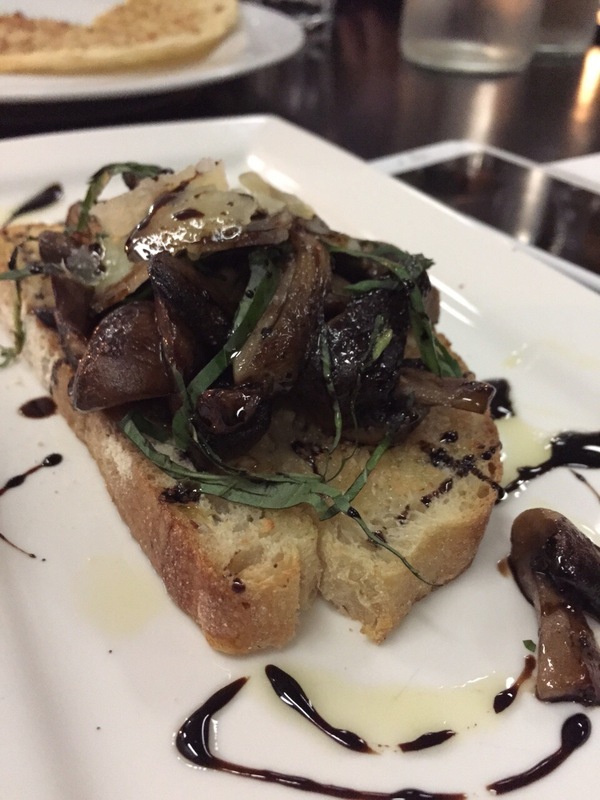 Baked mushroom swiss browns with crispy music bread and smoked buffalo mozzarella ($15.50). 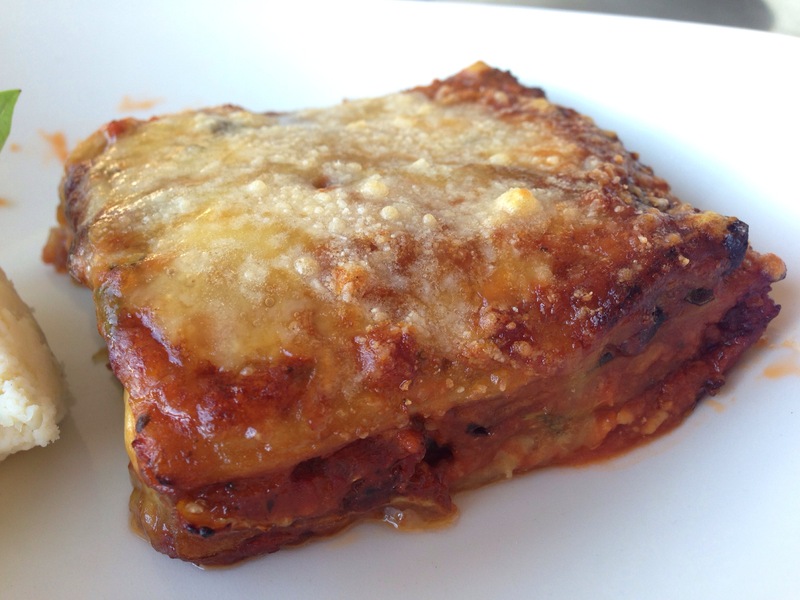 This is one of TimmyC’s favourite entrees but we both had split opinions that day; I thought it was better than usual and TimmyC didn’t really enjoy it. I really like mild flavours of the mushrooms and mozzarella against the crispy textures of the bread. 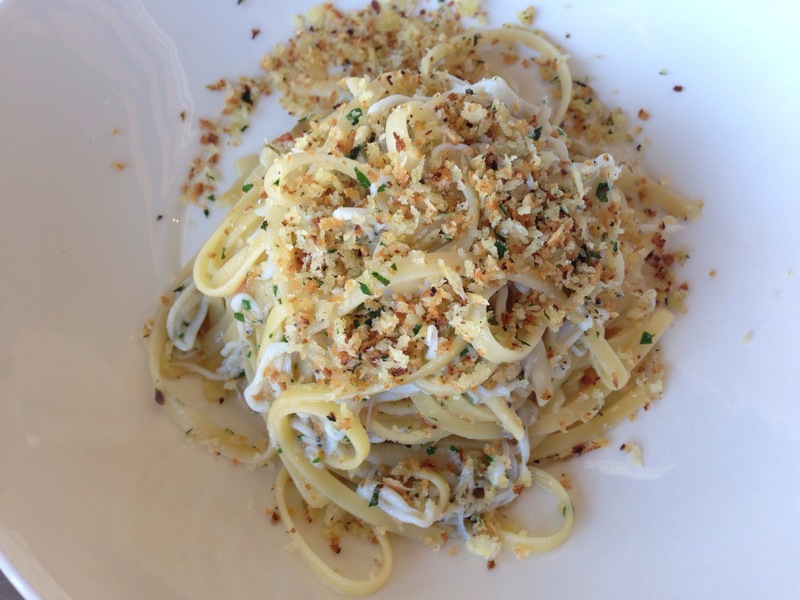 Tagliatelle bolognese ragu of beef, pork, herbs, Chianti and parmesan with crunchy herby breadcrumbs ($19.50). 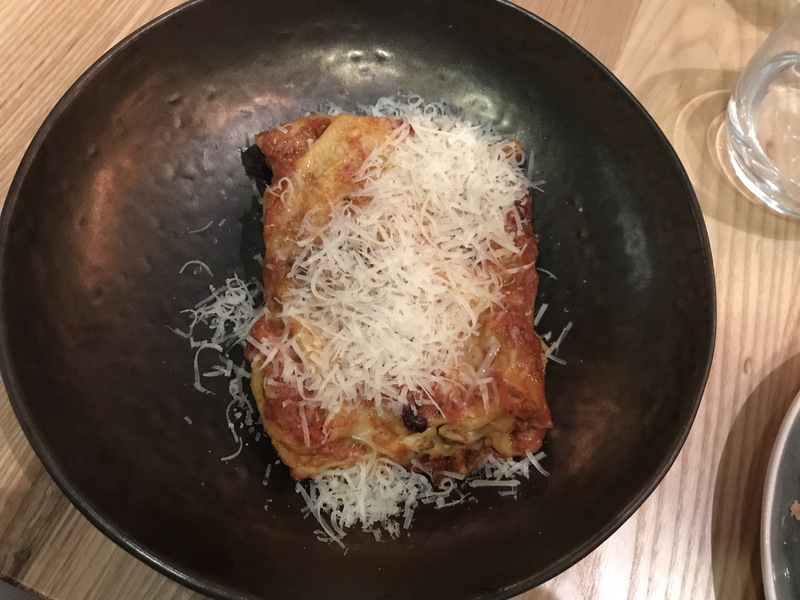 This is our ‘go to’ dish when we go to Jamie’s Italian, it isn’t because it is the best bolognese we’ve had but it’s one of the better things that we have tried and I really enjoy the crunchy herby breadcrumbs. I think TimmyC enjoys this more than me, as a personal preference I enjoy my bolognese with more meat. Polpetta spaghetti beef and pork meatballs, tomatoes, garlic and red wine ($18.00). Why oh why do I stray from the usual, I guess the food blogger inside of me wishes to make a new found discovery of something else that is delicious on the menu but I really didn’t enjoy this. As soon as I put a bite in my mouth, I knew the pasta was too under cooked for me, it was even a tad before al dente. The meatballs were a tad dry and bland but I enjoyed how they gave me a big spoonful of the herby crunchy stuff. I was too hot and bothered to complain and I didn’t finish my plate (which usually never happens). It looked so promising before I had a taste. 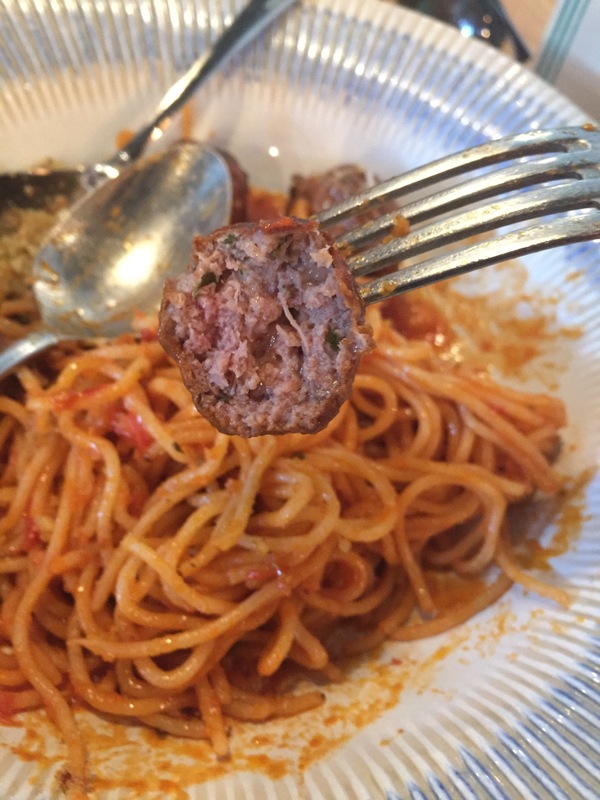 A dissection of the beef and pork meatball. 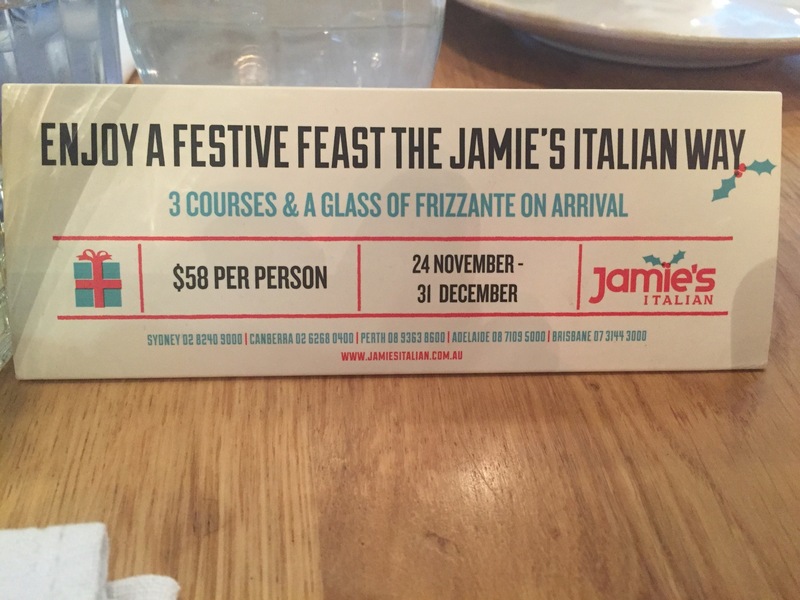 I’m surprised that Jamie’s Italian is open during this window period but maybe it is to cash in on the holidays when most things won’t be open. I remember the days where you just eat yourself silly and spend time with friends and family at home because nothing was open but now boxing day sales start early and even the cinemas are open! I find it puzzling about where this place goes wrong; the menu looks good, the staff are friendly and attentive, I guess it is mainly the execution of the food. 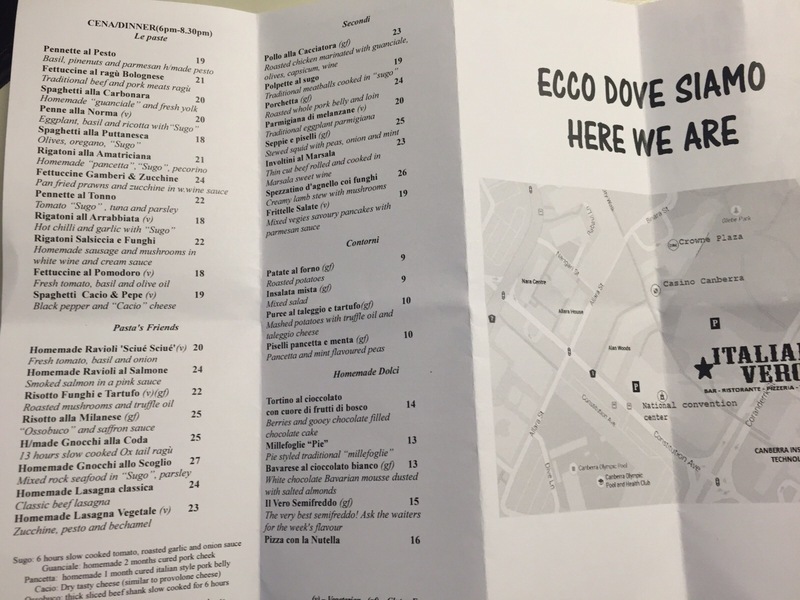 The weird thing is that it isn’t the worst Italian I’ve ever eaten, would I have been this critical if Jamie Oliver’s name wasn’t attached to the restaurant? I guess that’s the problem with trusting another chef with your name branded over a restaurant, it is situations like this that have stopped famous chefs like Adrianno Zumbo from opening a store in Canberra, they need someone who they can trust to consistently create a product of high calibre that they would be happily be associated with. 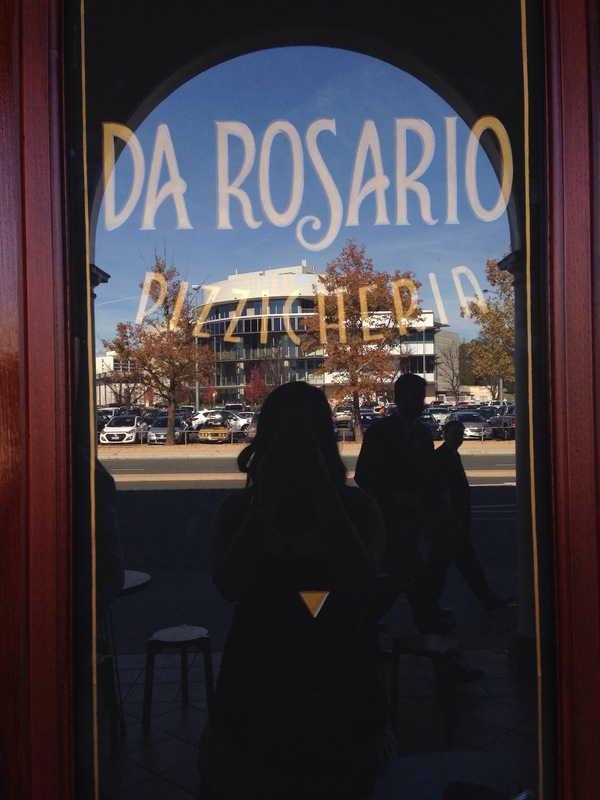 After eating a massive morning tea with at least four different desserts on my plate balanced out by lots of cheese, I found myself out at lunch an hour later clutching onto my tummy, but I perked up again when I realised I requested to go to Da Rosario for my birthday lunch. I’m a big big fan of Italian food. We found it easily enough even though it was just a few tables on the walkway just outside of Mezzalira and Charcoal restaurant. 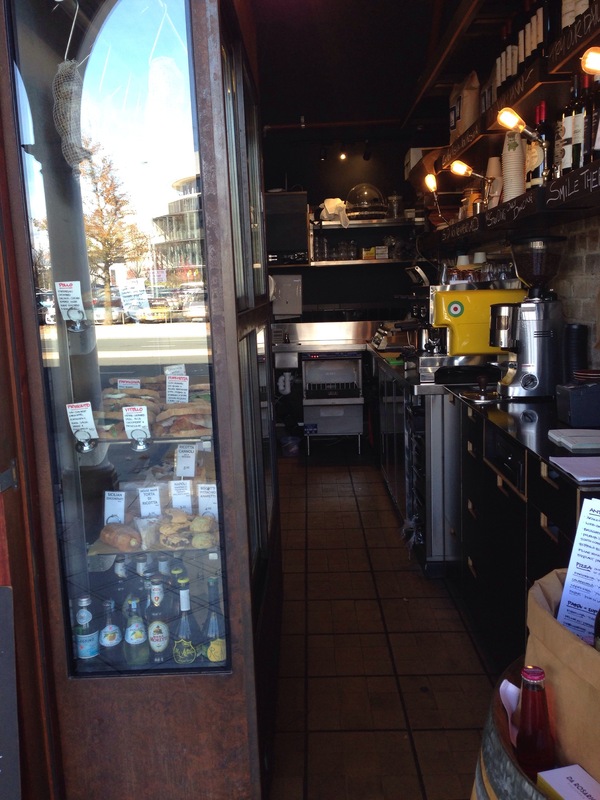 There is no actual ‘inside’ for patrons but there is a hole in the wall which has a cake/sandwich display built into it and enough room for a basic assembly kitchen, all the food is made in the Mezzalira’s kitchen and pizza oven. 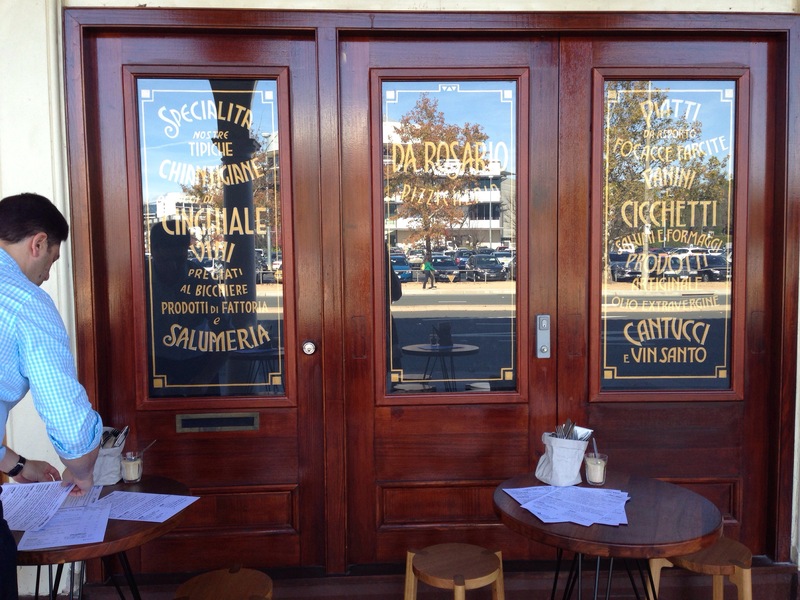 I love these beautiful doors and the gold signage. 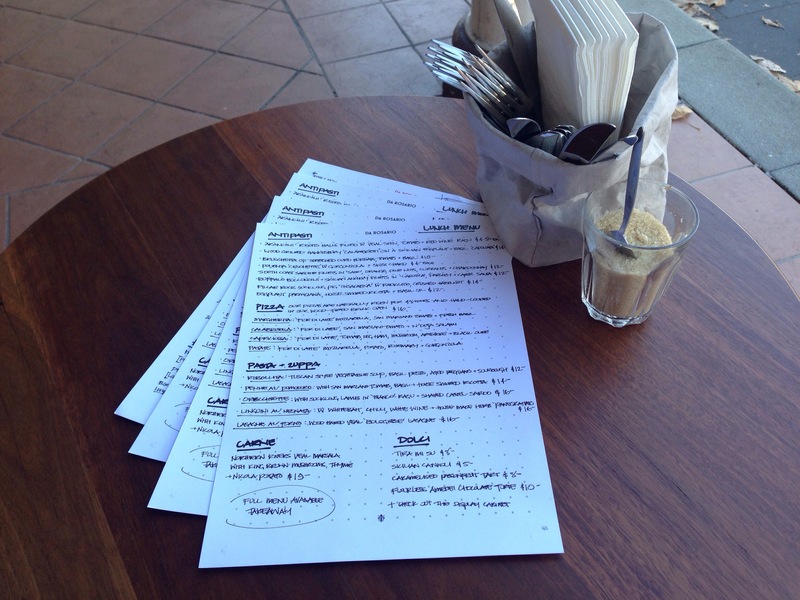 They menu is a bit hard to read with the paper having a patterned background and the particular font they used but I thought the ‘sacks’ of cutlery and napkins were super cute. Polenta ‘crochette’ with gorgonzola and swiss chard ($4.00 each). 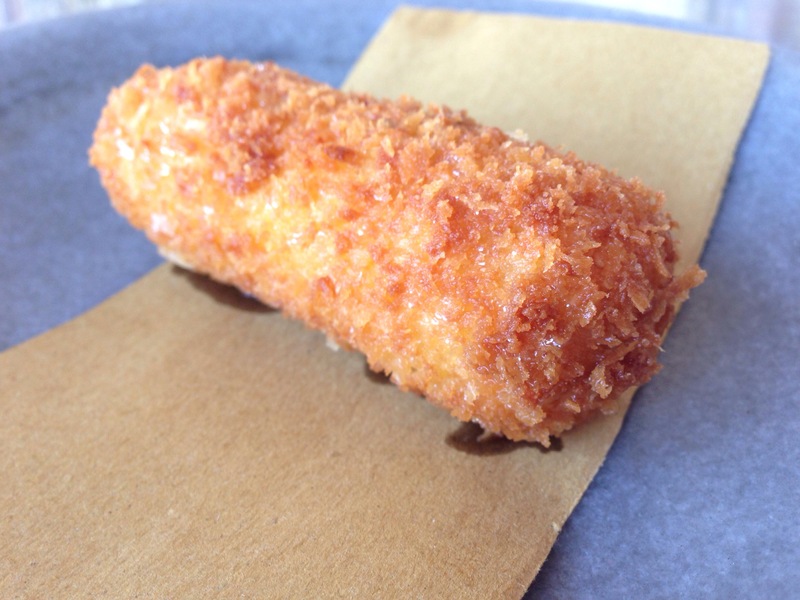 The croquette was slightly oily but it did have a crispy outer layer and a delicious soft cheesy filling. I wish it wasn’t $4 a pop for 1.5 bites. 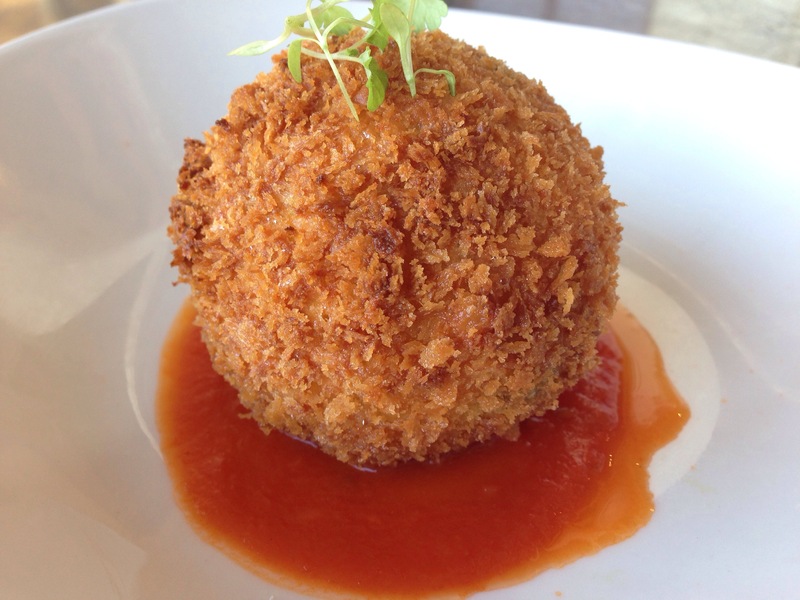 ‘Arancini’ risotto ball filled with veal shin, tomato and red wine ragu ($4.50 each). This was one of the biggest arancini balls I have ever seen! It also had a crispy exterior but I’m afraid that the filling didn’t ‘wow’ me all that much. In comparison to the other entrees it was disappointing. 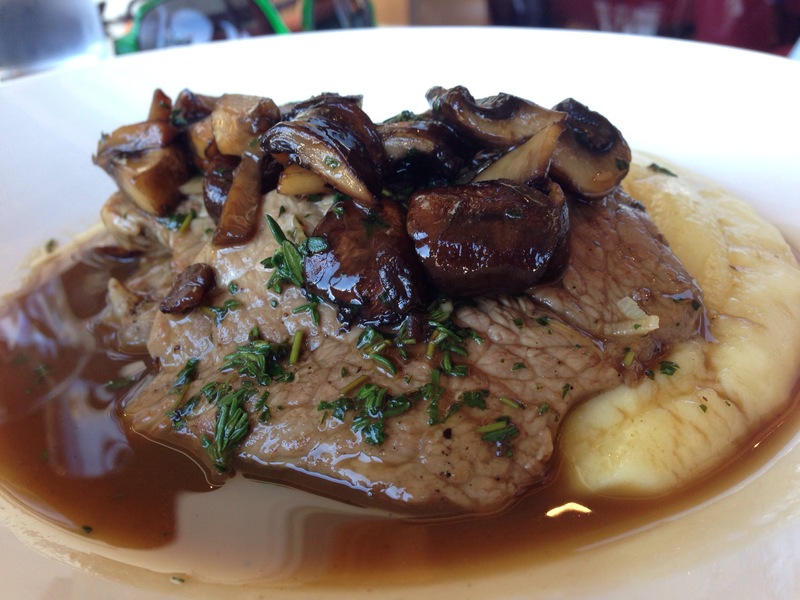 Northern rivers veal, marsala with king brown mushrooms, thyme and nicola potato ($19.00). I only tasted a bit of this dish but the potato mash was extremely creamy and soft and the sauce was addictive and salty. 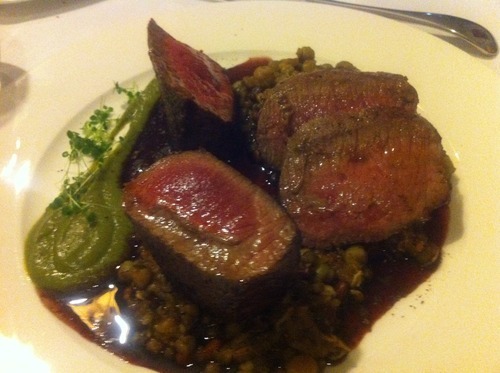 My friend tells me that the veal was very tender. I would order this dish. A close up. Linguine al neonata (? 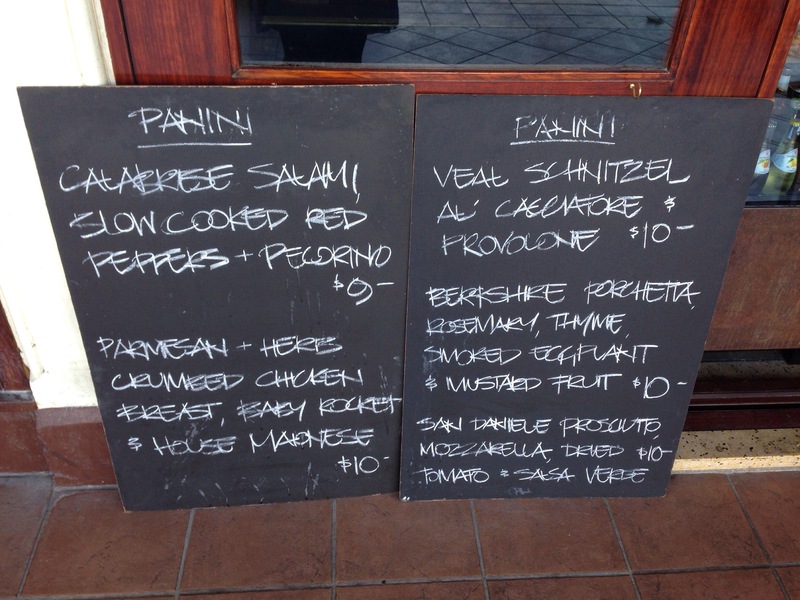 I think that’s what the menu said) with whitebait, chilli, white wine, house made herb pangrattato ($16.00). The pasta was al dente with a lot of the flavours being simple and fresh. The fish and pangrattato was a bit too salty for my friend but I thought it gave a good flavour to the dish. 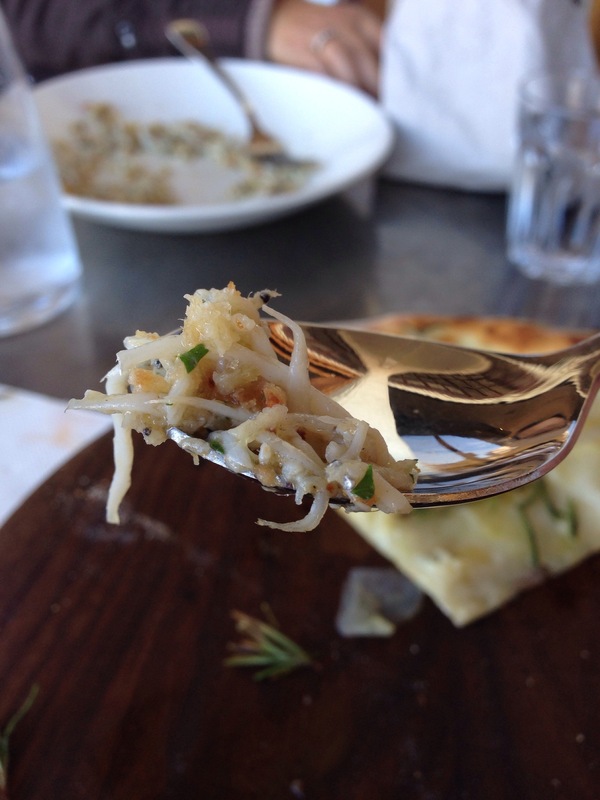 I didn’t know how the whitebait would turn out but it was delicious and I would order this dish. A close up of the whitebait. 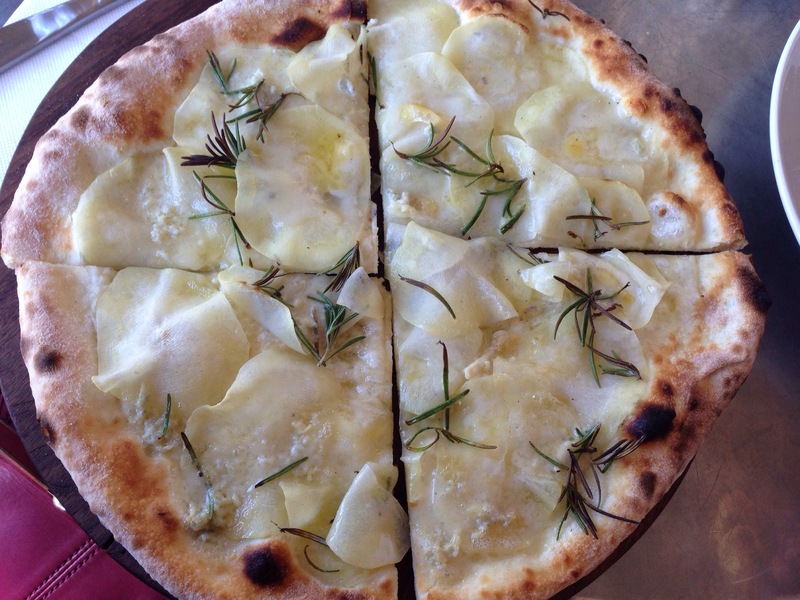 Patate ‘fior di latte’ ,mozzarella, potato, rosemary and gorgonzola pizza ($16.00). As usual, I couldn’t decide on what dish to order so the waiter came to my aid and helped me decide between the lasagne or a pizza. 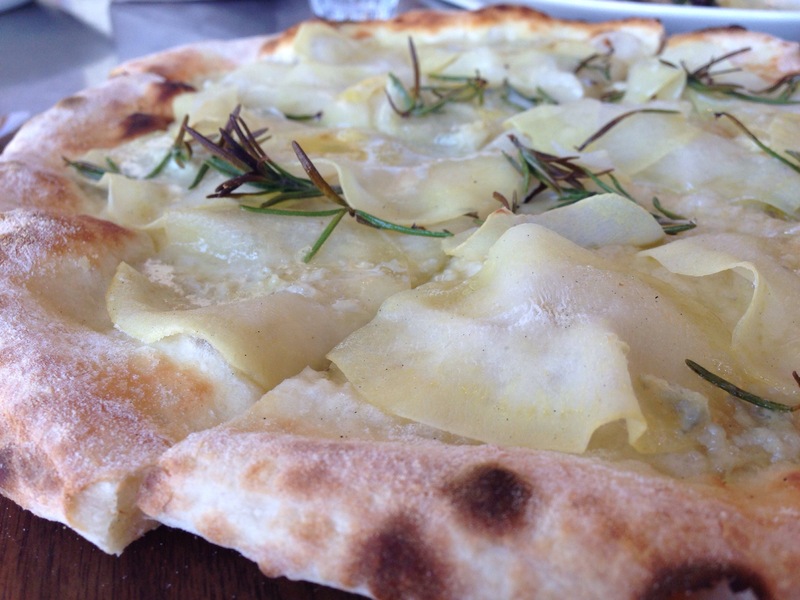 He said as nice as the lasagne is, the potato pizza is particularly good. 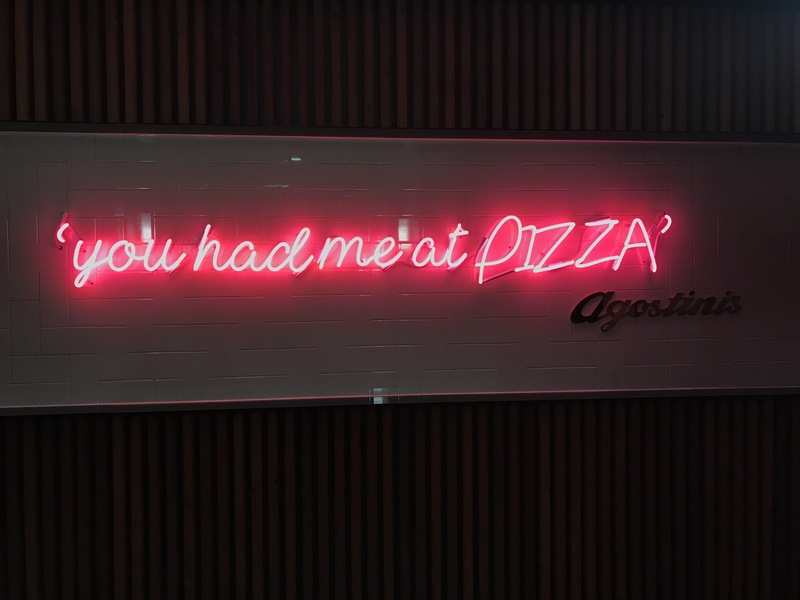 I’ll go with the pizza then. The pizza had a perfect thickness to it, having a crispy crust with a sturdy base to the pizza topping. 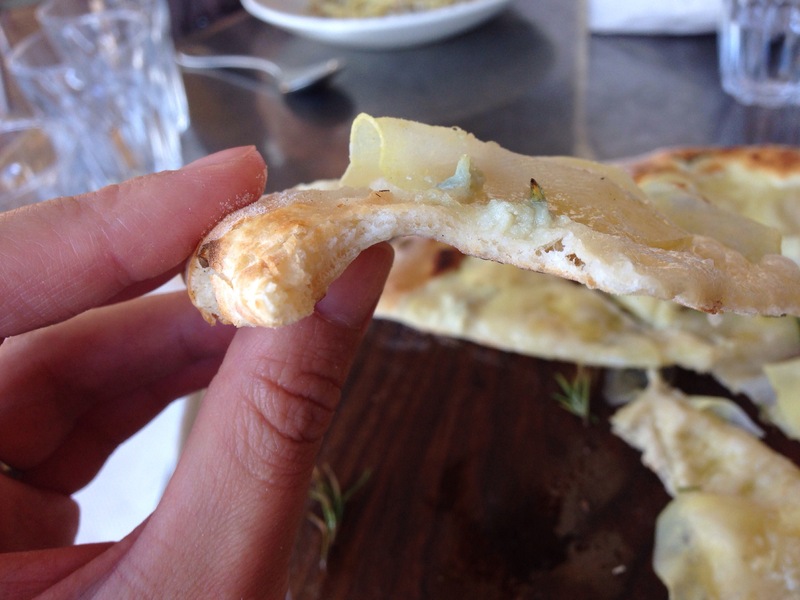 The subtle dollops of gorgonzola throughout the pizza provided the perfect amount of salt and cheese. The potato was cut thinly for it to be cooked through and went very well with the rosemary. Definitely worth trying! I really love their tiramisu (if it is anything like Mezzalira’s) and I totally would have had two if I didn’t just scoff my body weight in cake just before. The staff were friendly and helpful. 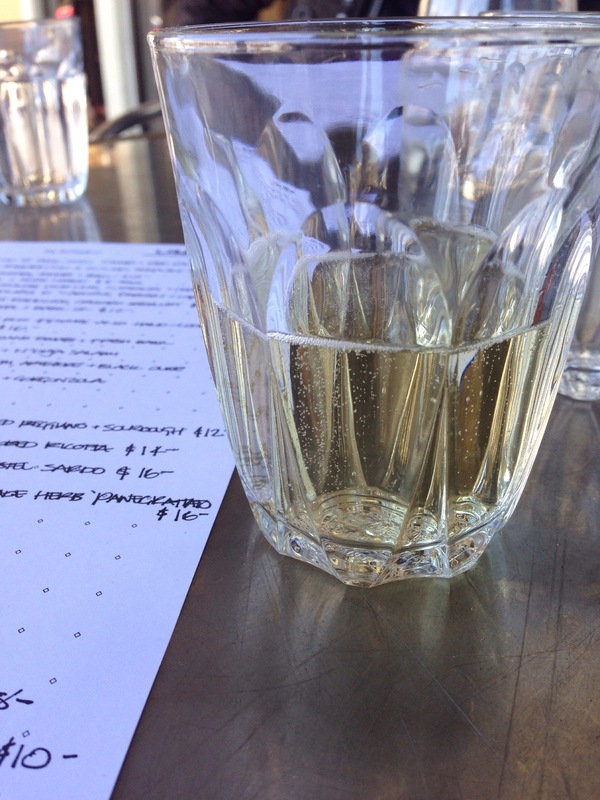 Not only were they attentive to our table water supply, they constantly topped up our glasses. Arriving just after midday, we had our pick of seats but not long after all 8 tables were taken and they were in the process of adding two new tables. A small cute set up with delicious food and simple stand alone flavours. If civic wasn’t so hard to get a park, I would come and eat here more often. **A small handy note – they don’t take reservations and they are only opened for breakfast and lunch. 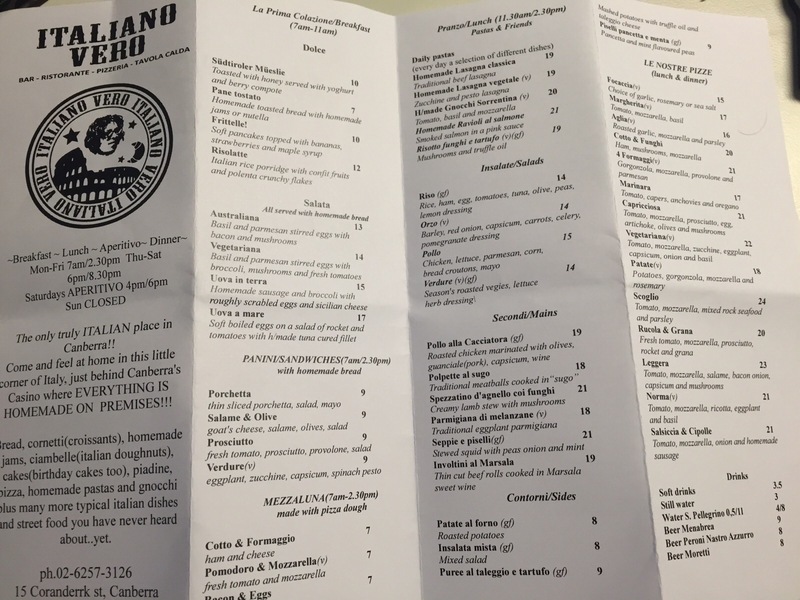 Phone: (02) 6230 0025 << same number as Mezzalira so don’t get confused when they pick up the phone, although Da Rosario don’t take bookings. 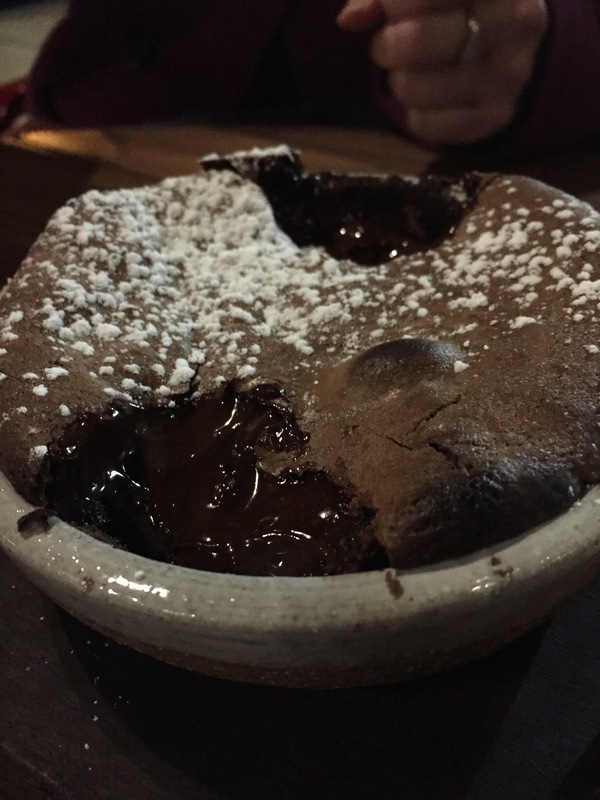 My friend couldn’t get into Jamie’s Italian for dinner while she was in town so I didn’t think she should have to miss out all together, so after Mr. Wei’s we walked over without a reservation to enjoy some dessert. I had only had one dessert here previously and it was one of the best things of the meal so I wasn’t hesitant to try the rest of the dessert menu. 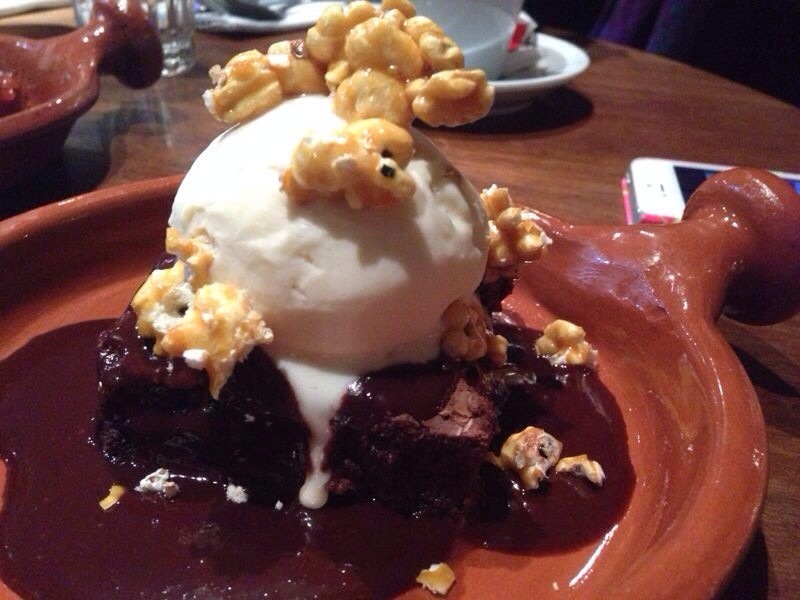 Jamie’s Italian Epic Brownie warm fudgy brownie with amaretto ice cream & caramelised amaretti popcorn ($10.00). The amaretto might have been subtle but for someone who doesn’t like the flavour, it was too much. This dessert was very OTT, rich and very filling. 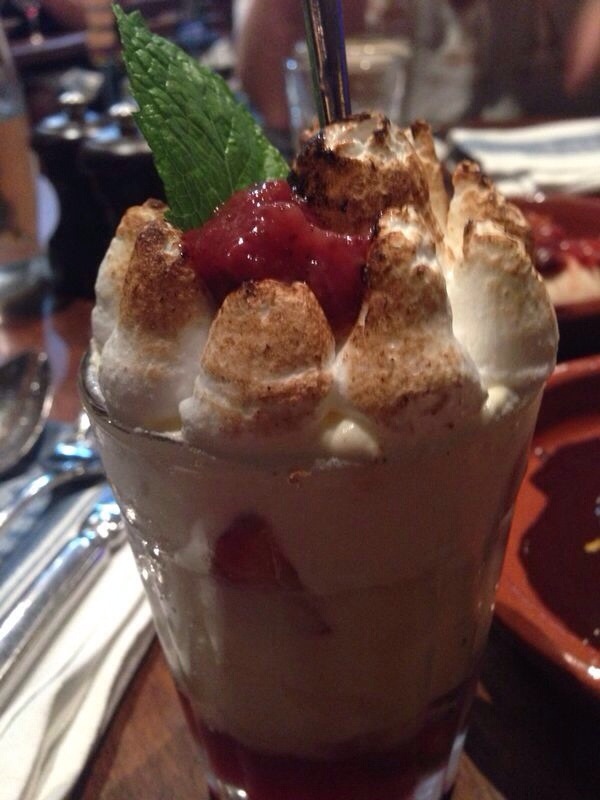 Trifle fresh strawberries with strawberry jelly, custard & glazed Italian meringue ($10.00). It was hard to scoop through all the layers without making a mess around the tall glass. 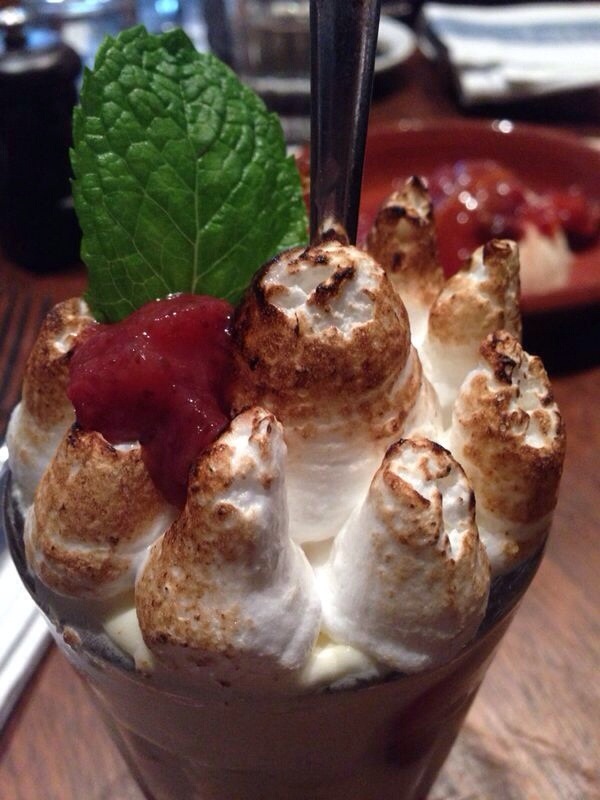 This is a classic old school dessert but there wasn’t anything special about it except for its glazed Italian meringue hat. 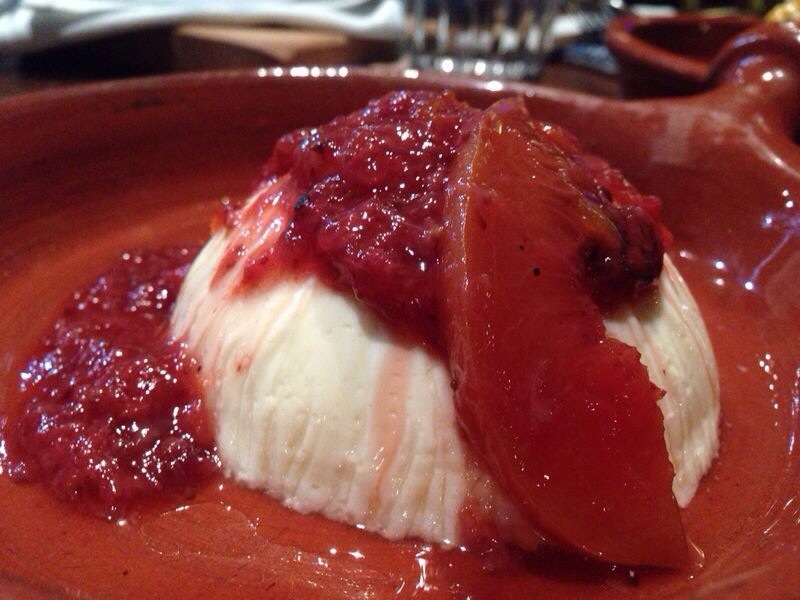 Panna cotta lovely wobbly panna cotta served with a compote of seasonal fruits ($8.50). Probably the nicest dessert of the night, it was very wobbly, not overly sweet with simple flavours. Not all these desserts are for me but that means that there is a nice variety on the menu. So far the raspberry frangipane with fresh raspberries & almond filling with creme fraiche ice cream & berry drizzle is my favourite dessert on the menu, followed closely by the panna cotta. During one of my very rare occasions that I’m pub/bar/club hopping in Civic, I notice that Gelato Joe’s has shut up shop and the new Dolce & Salato Pasticceria is refurbishing. Can’t wait to see if it is any good. 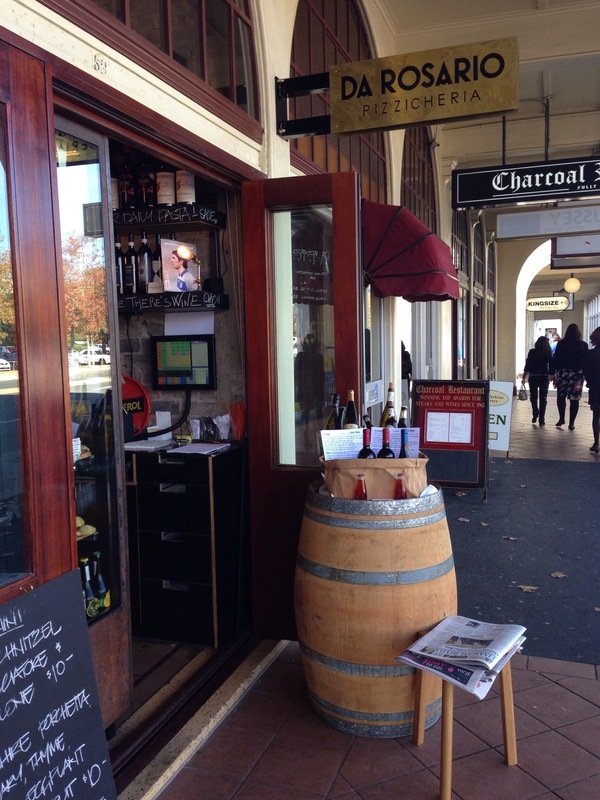 We were trying to fit in as much as we could before we flew back to Canberra later that day and we were going to finish the trip off with great Italian food based on a recommendation at Il Bacaro cucine e bar. 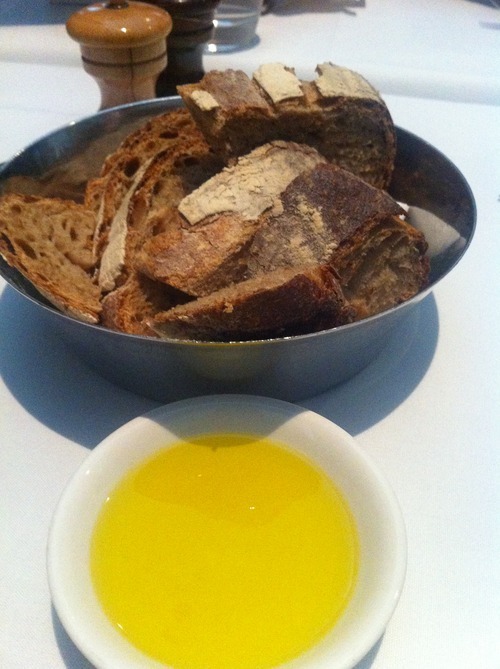 Complimentary warm bread with gorgeous olive oil. 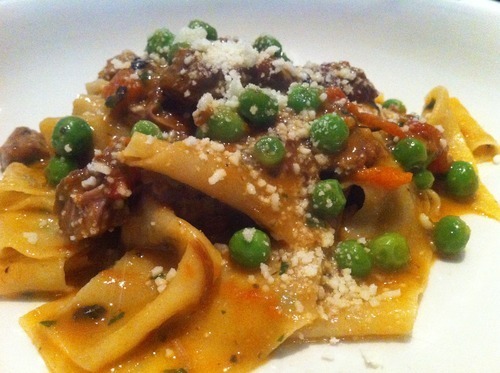 Pappardelle con ragu d’agnello, piselli, tartufo e pecorino hand cut pappardelle with lamb ragu, truffle paste, peas and pecorino (sml $29.00). The lamb itself was tender and so flavoursome, that the pasta being fresh and a perfectly cooked was just a bonus. 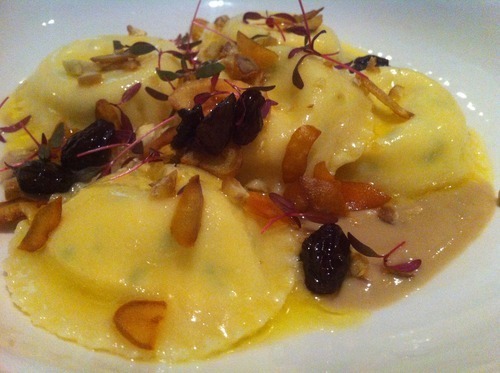 Ravioli di fontina con castagna e uva moscato fontina ravioli with roasted chestnut, muscatel and chestnut puree (lge $35.00). 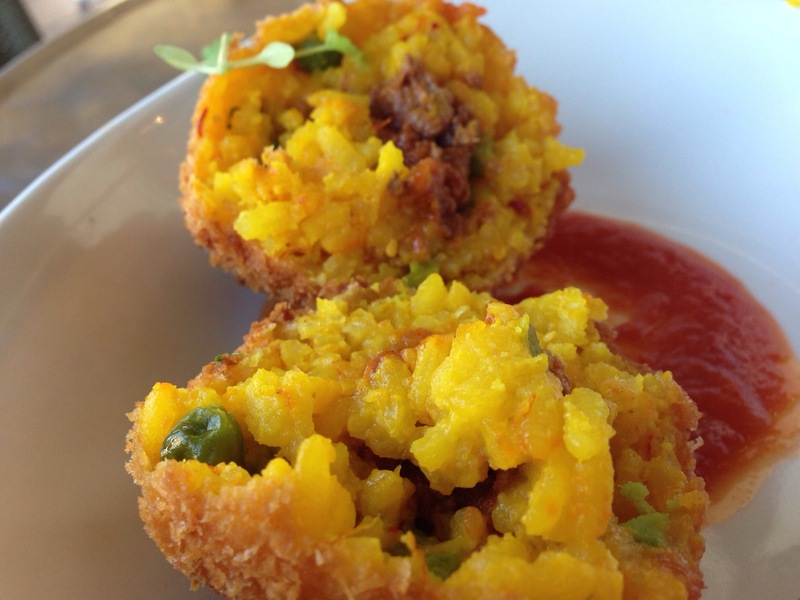 Amazing delicate parcels filled with subtle cheese presented beautifully on the plate. This was truly delicious! 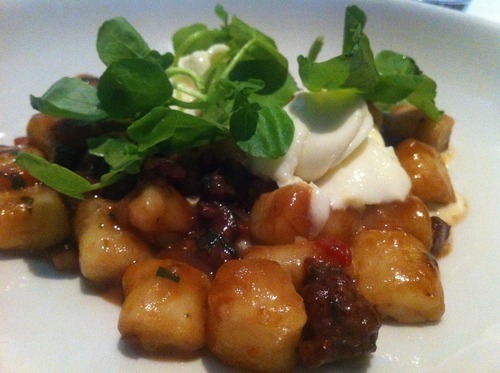 Gnocchi con ragu di lepre, cioccolata e burrata gnocchi with hare ragu, chocolate, and burrata (sml $29.00). 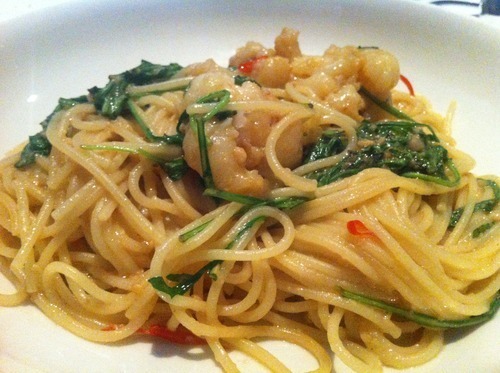 Spaghettini con cicale di mare, aglio, “olio visadi” e rucola spaghettini with Moreton Bay Bugs “olio visadi”, garlic, chilli and rocket (lge $39.00). 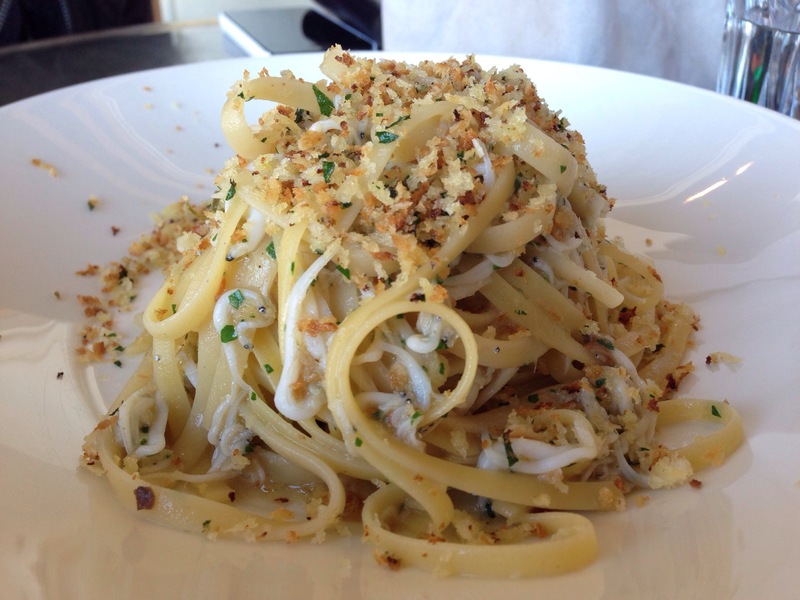 A nice hint of spice with perfectly cooked bay bugs and pasta. I love the fact that they wilted rocket throughout the dish and I didn’t have to add any cracked pepper. We didn’t have time for dessert as we wanted to squeeze in a spot of shopping before flying out but their dessert options did look tempting. The dining room quickly filled up with suits having lunch, which made me and my comfy airport outfit feel very under dressed. The portion sizes are very small but that doesn’t take away from the amazing flavours from the pasta. 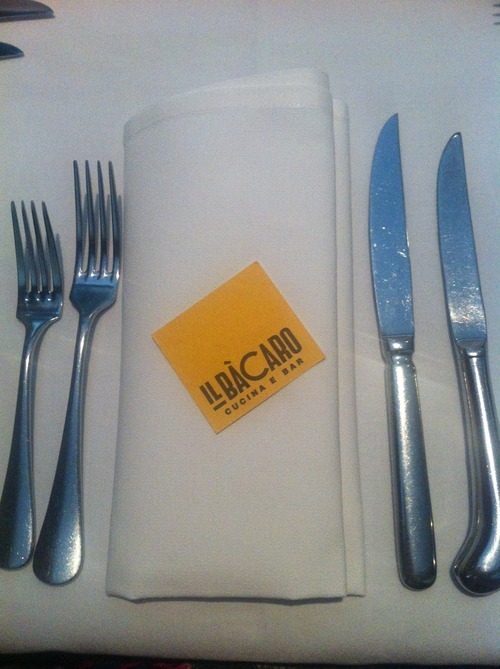 This is one of the best Italian restaurants I have eaten at. I would come here again and maybe ask for more bread if I wasn’t full enough (or maybe an expensive dessert or two?). I booked on Saturday night for Monday lunch with no problems (they are closed on Sundays) but if you were going for a busier time maybe book ahead. I’ll admit it now, we were a bit disorganised when it came to planning our meals for the weekend, I had only really sussed out brunch options and afternoon cake areas. We probably should have planned our dinners more wisely. After Mr. Hive was completely booked out (we almost got a reservation for 7 people at 9:30pm but even then I would have been starving by that time), we started searching for alternatives. Dumpling restaurants, Spanish tapas, Mexican and even Mrs. Parmas couldn’t fit in 7 people or not without being seated ridiculously late. After my fifth call (my other friends were calling around too), I started to loose hope, even if a restaurant was able to seat 7 at a decent hour without being booked out on a Saturday night, what’s that say about the restaurant that we were left with? I searched for restaurants on Lygon street, I had never really been impressed with that area before but these were desperate times. 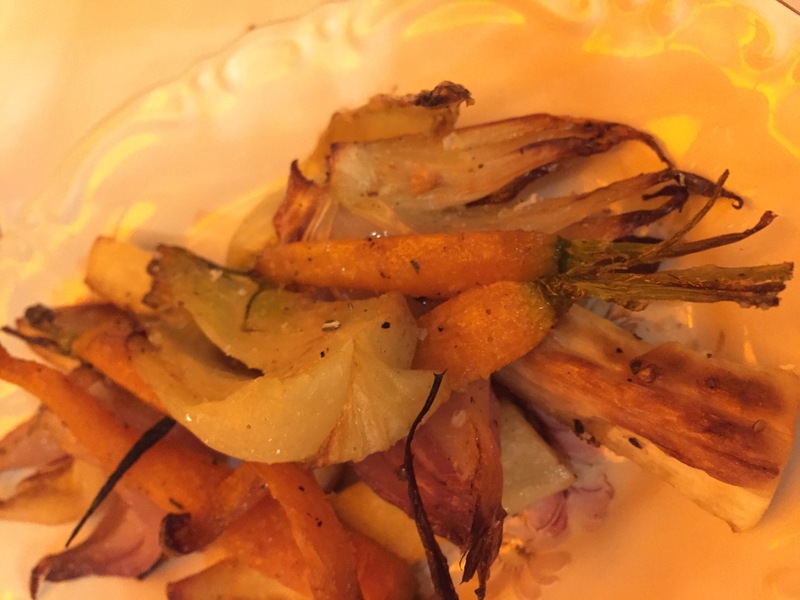 I had seen on Urbanspoon that Svago Ristorante rated rather quite highly with recent raving reviews from patrons. I dialled the number and asked if they had an opening for 7 people around 7:30pm with a hopeful tone. They said that was not a problem and looked forward to seeing us. I breathed a sigh of relief, finally we got in somewhere! Hmmm but that only left us girls 45 minutes to all get ready and be there… Better start getting changed! We were taking someone down Lygon street for the first time, I told them to count how many people ask them to come into their restaurant to eat while we walked one and a half blocks. 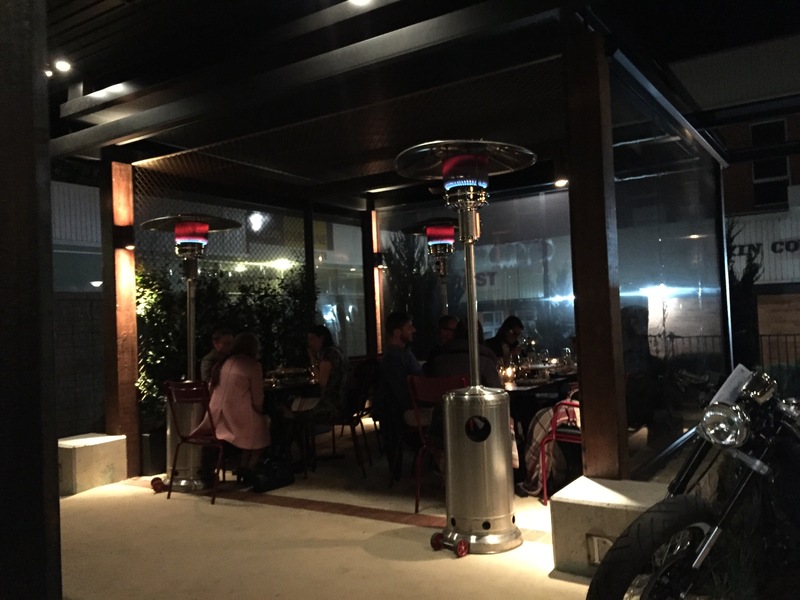 After being pestered by many Italian men all rugged up braving the outside weather, we finally find Svago Ristorante in a quaint quiet, romantically lit restaurant with no spruiker out the front to wave us in. I love their Robert Welch cutlery set! 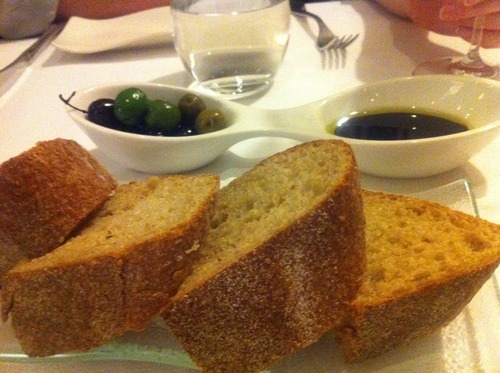 Complimentary bread and olives – delicious warm bread served with fabulous olive oil and balsamic and a great selection of warm olives. 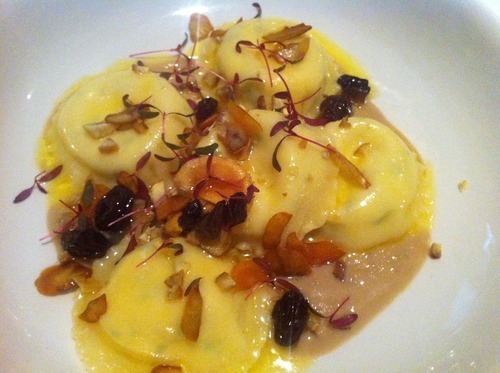 Pear gnocchi homemade potato gnocchi with Taleggio cheese, pear and roasted walnuts ($23.00). 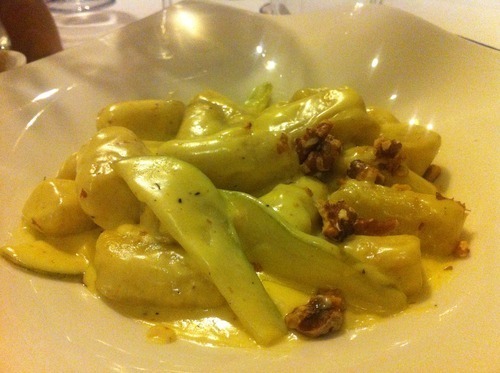 The softest parcels of gnocchi with a fabulous cheese sauce balanced by the walnuts and sweetness of pear. The only complaint would been that they could have used a few more walnuts in the dish. 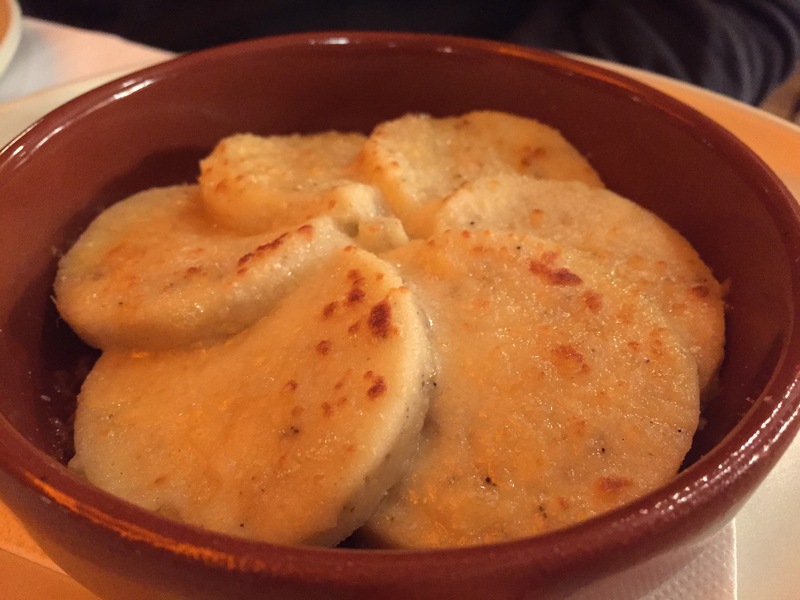 One of the best gnocchi I’ve ever eaten! Spaghetti del mar homemade spaghetti with fresh seafood in a salsa verde sauce ($25.00). 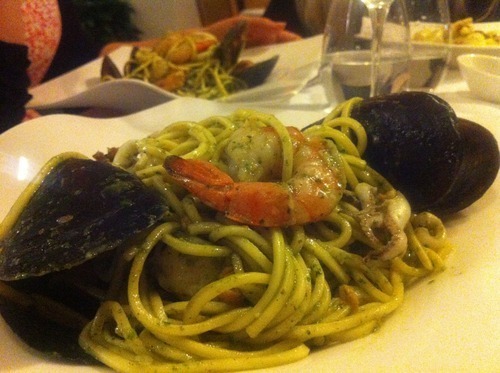 Perfectly cooked pasta with a good mix of seafood, although one of my mussels did taste like it just came out from the sea. I think this dish could have done with some chilli though. I asked for some parmesan cheese and they gave me a delicious freshly ‘microplane’d cheese, no powdered stuff here. Loin of lamb lamb backstrap served with braised sprouted legumes, pea puree and juniper berries jus ($31.00) served medium rare. My friend absolutely loved her lamb. 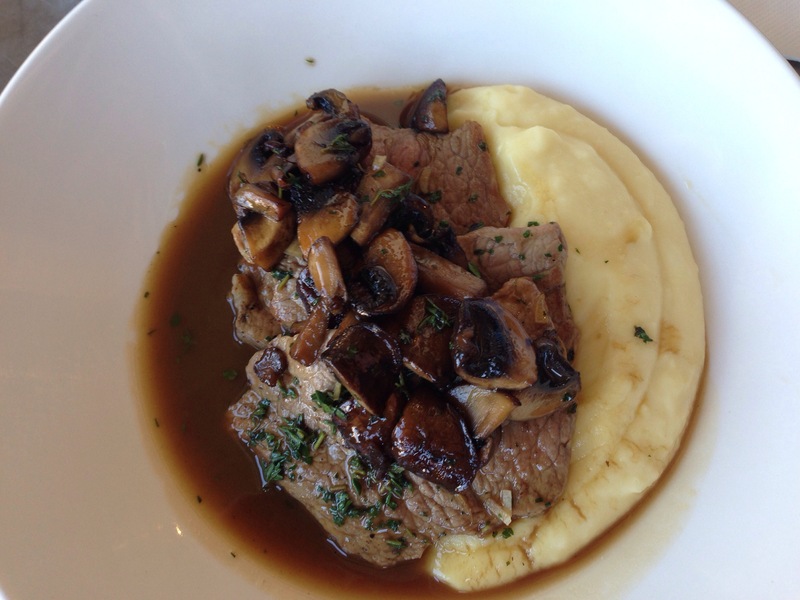 Aged fillet steak of beef char-grilled eye fillet, served with horseradish potato puree, roasted shallots and red wine jus ($34.00). 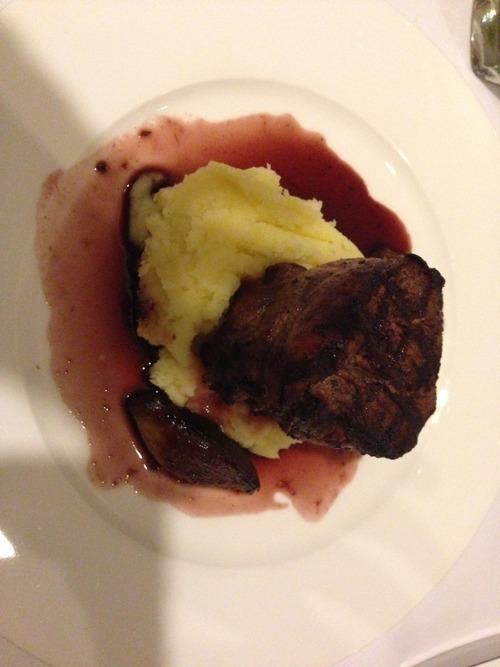 The boys promptly finished their steaks which were very tender and well cooked. We weren’t going to stay for dessert. Half of us wanted to eat somewhere else to get a bit of variety and then the other half wanted to stay because the experience so far had been so wonderful. Two of us were just going to share a tiramisu but when we ordered, everyone else happen to sneak in an order as well. Individually baked banana cake caramel sauce and ice cream ($12.00). 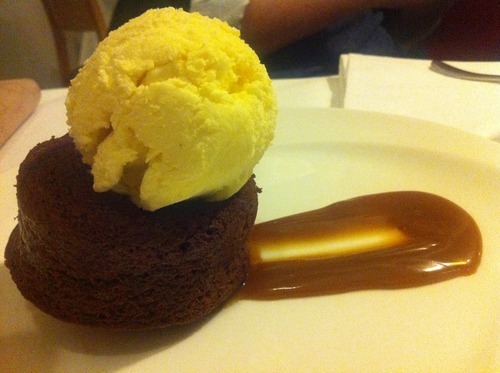 Made to order, these cakes were steaming hot and perfectly accompanied by ice cream and caramel sauce. Dutch chocolate mousse with liquid chocolate Galliano centre ($14.00). 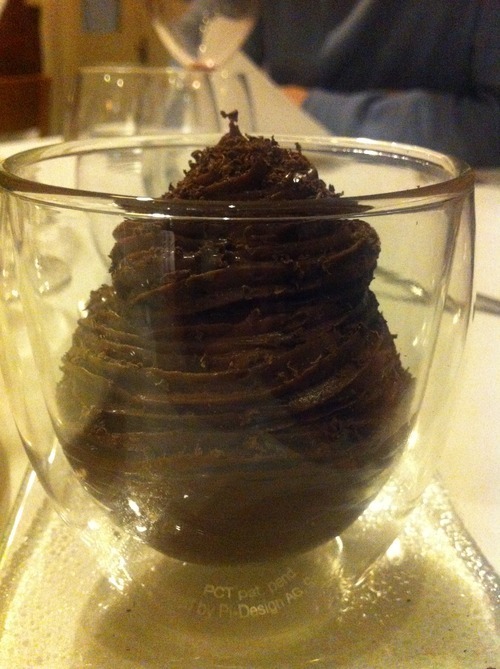 A very rich mousse with a smooth shot of Galliano to warm the heart and stomach as you took a bite. Tiramisu our way your own way… DIY ($13.00). We were really curious about what the description meant, the waiter kindly offered to show us how to assemble the dessert- stack the lady fingers, pour the espresso all over, smother with mascarpone cheese and top with a bit of Frangelico, rinse and repeat. 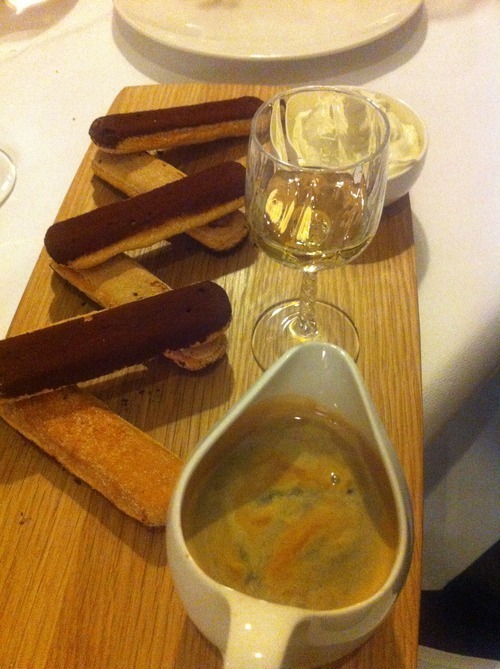 We probably didn’t leave the sponge fingers in enough espresso as some were still hard as we dug our spoon through. The strong espresso hits the palette soften by the taste of mascarpone then finished with a delicate after taste of frangelico. This dessert is more for novelty but I think a good consistent dessert needs to be left to the kitchen. 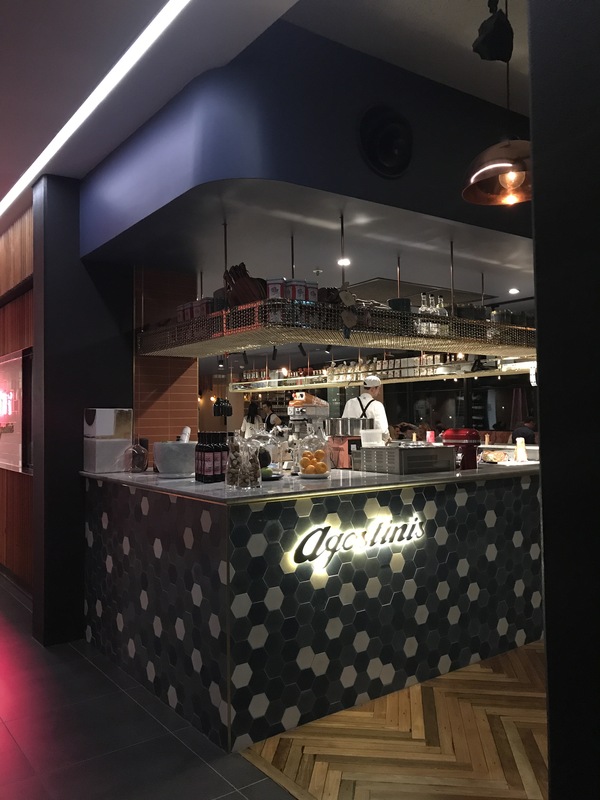 I have eaten in many restaurants down Lygon street and I never understood what the fuss was about, for me it was always mediocre food, powdered parmesan cheese and spruikers. 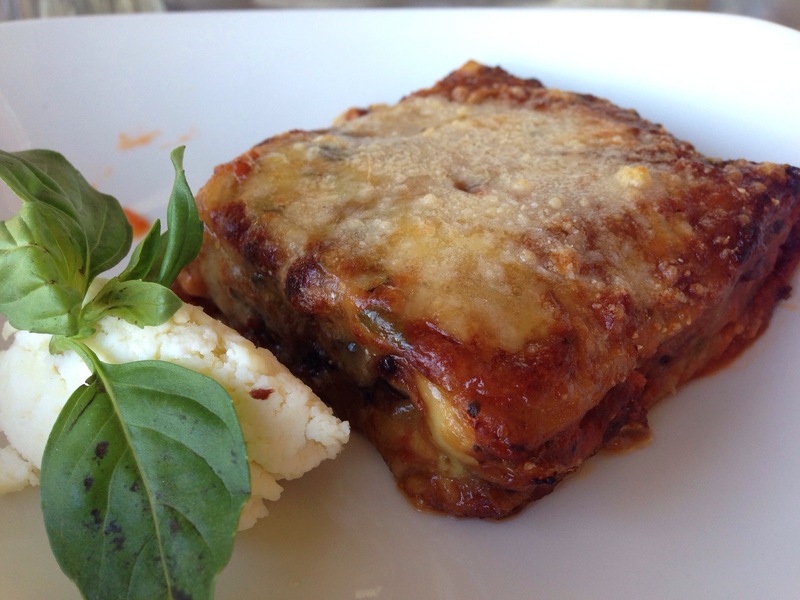 Svago is the best place I have eaten at here with top notch pastas and secondi options. 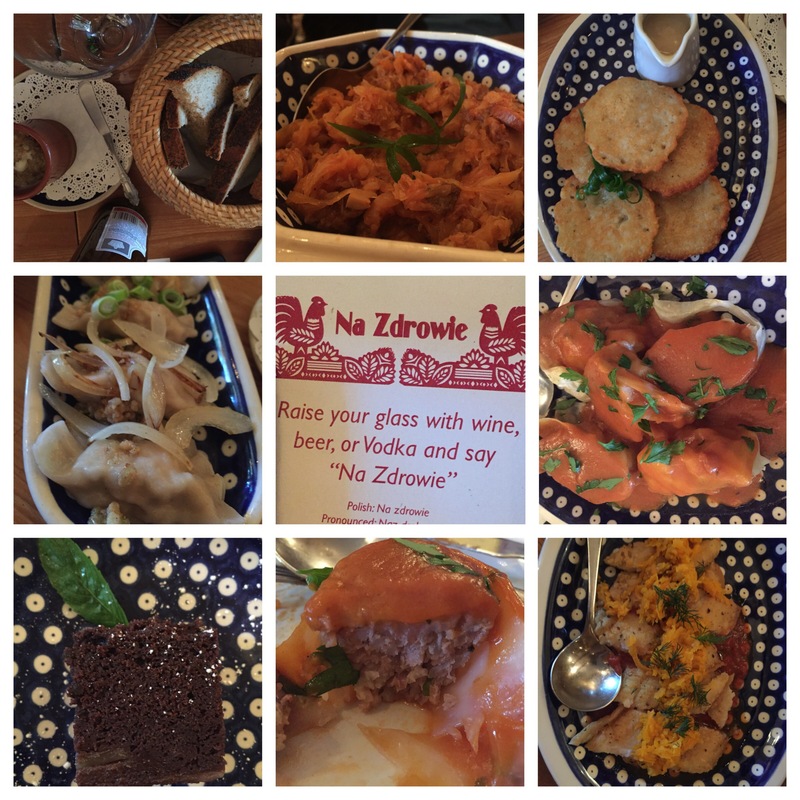 We were thrilled with the service and the food. I’m still astounded that this little gem on such a busy street wasn’t filled with more patrons but that was fine by us as we got to chat and laugh and not compete with other table noise.